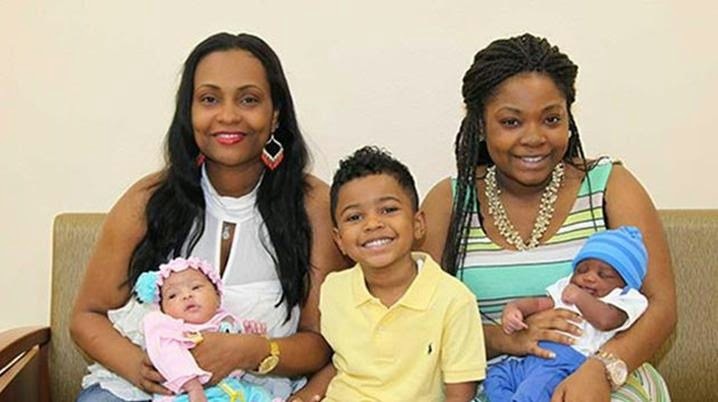 Angela Patram (left) with her baby Rayna and son C.J., and her daughter Teranisha (right) and her son Jerry. A US woman and her eldest daughter have welcomed two new additions to their lives after giving birth within minutes of each other. Ms Patram was scheduled to be induced on February 19 while Ms Billups was due to have her first baby two weeks later, on March 6.But on February 19 mother and daughter were both in labour in rooms next door to each other.Ms Patram’s fifth child, Rayna Simone Patram, came into the world at 6:29 pm, while baby Jerry Michaud Jr arrived via caesarean section 34 minutes later.